Earlier today, as I was reviewing my Cleansing and Polishing tool(read the review here), I got a newsletter from Sigma Beauty. It was about the launch of a new product, a set of three new attachments for the Cleansing and Polishing tool. And now the big news!!! The attachments are especially designed to create the ultimate spa experience! Who wouldn’t love a spa in his own bathroom? The Extra-Soft Brush: a silicone attachment that is perfect for gentle cleansing of extra-sensitive skin. The Massager, a unique silicone massager attachment that maximizes absorption of skin care products and stimulates skin circulation. The Exfoliator: perfect for removing dead skin cells to reveal healthy looking skin. It is made of pumice stone. 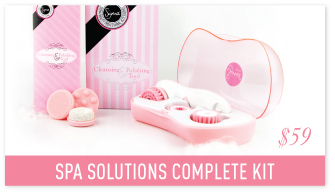 You can buy the Spa Solutions Complete Kit at www.sigmabeauty.com for $59. The Kit contains the Cleansing and Polishing tool and all the available brush heads and attachments. Would you like to try that new Sigma product? Do you like the idea of having everything you need for a spa treatment just with one tool? If you decide to purchase it, let me tell you that there is a 10% discount for all your purchases valid till 29th February 2012. You just have to enter the code LOVE2012 at checkout.